Gucci is an iconic brand, and it began with his small luggage and leather goods business in Florence, Italy in 1921. The brand grew out of its exceptional creativity, introducing timeless standards such as the “Bamboo Bag”, the trademark green-red-green web, and the legendary double “G” logo. Today, the creative director is Alessandro Michele, who has been moving House Gucci into a more progressive, modern and influential direction. Romantic and eclectic, the new Gucci style is still contemporary by maintaining its attention to detail and craftsmanship. Follow this link to see the official website of Gucci. The new creative director of Gucci is Alessandro Michele, and he is imprinting his vision with vigor: a redefinition of luxury for the 21st century. His vision will further re-emphasize and enforce Gucci’s position as one of the world’s leading fashion houses. The Gucci design ethic has always been one of eclectic, romantic, and yet modern vision, standing for the peak of Italian quality and craftsmanship along with an obsessive attention to detail. Gucci is the best selling brand in Italy, and with good reason. Alessandro Michele took the helm in early 2015 after 12 years in the Gucci design room. With an impressive that extends from Fendi to Tom Ford, to Gucci, Alessandro is passionate about the decorate arts and the role they play in embellishing all of his creations. Thus, eyeglasses fit well into his ethic as a crucial and determining factor in rounding out the face. 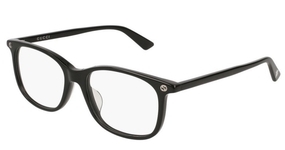 The Gucci eyeglasses collection, as a result, is large and eclectic, and offers variations for any kind of situation, male or female, office to party, formal or informal. The Gucci company itself finds its beginnings at the end of the 19th century in Italy. Guccio Gucci started the company by focusing on leather goods and especially travel luggage, and his first designs held classic styling. The company grew and he trained his children Aldo, Vasco, and Rodolfo Gucci in the trade. During the second world war, they were forced to make handbags our of canvas since leather was not readily available. This gave rise to the now-famous double G-symbol which is combined with the red and green bands.